the hubby is gone for the week, so i’m going to let you in my little guilty pleasures that i indulge in when i’m playing bachelorette. i can have cereal for dinner. whenever. i. want. i can stay up as late as i want, reading, without anyone harrumphing. i can sleep in late if i want. i can spread out my art projects all over the house. i can watch as much crap tv as i want (bones!). 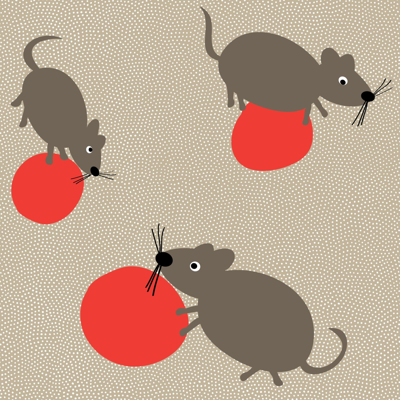 check out the cute mouse fabric at spoonflower here. Entry filed under: about me. Wow, we have very similar styles when it comes to being single for a few days. Sometimes I even sneak in a doughnut (I’m not allowed to bring them in the house when the hubby is around – unless I feel like making him want to throw up, which I usually don’t).